The new Facebook page has a brief welcome video with Ambassador Chris Hill. As of this writing, the page has approximately 1,100 fans. It has an English Language Center (Do you know the expression “once in a blue moon?”) and about a dozen photos (no, not thumbprint size photos). It looks like it was set up in late November; contains sporadic posts and links to the White House and the mother ship, but not much locally generated content from its administrators. So—don’t get your hopes up! 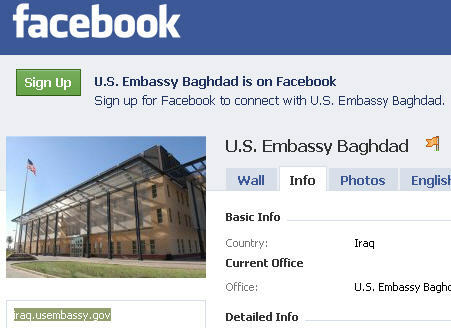 Window hours and consular services are included, as well as a list of holidays in the info tab. It does not look like this is run by Public Affairs or by IRC but by the Consular Section. I thought I’d waste some more of my time and send an email to the press office for confirmation. (Makes a difference who’s running it!). Of course the only one who broke my record of non-response from State’s Public Affairs shop is that one Press Officer in Kabul. Tee-Hee! […] The relief challenge is extraordinary, requiring the removal of bodies, the treatment of the wounded, and the feeding and care of millions of people. Complicating the effort is a chorus of critics who believe the response would be faster and more efficient under different leadership. They argue that the military or FEMA should be in the lead for the US Government rather than USAID. I have heard these appeals before when serving as the government’s coordinator for relief efforts in Bosnia, Kosovo, Honduras, Nicaragua and Haiti. Our aid agency’s Office of Disaster Assistance is statutorily authorized to respond to foreign disasters, both natural and man-made, and there is a logic to this. The office is staffed by professionals who understand the international community’s relief organizations, the network of non-governmental groups that contribute so much to the effort, and the local culture. They are experienced in working in developing countries and understand the complexities of these environments. They also understand how to prepare the relief phase for the reconstruction and development phases down the road. Other federal, state and local responder agencies including the US military, the Communicable Disease Center and major fire and rescue departments are seconded to OFDA. These organizations train together to handle foreign disasters. The OFDA operations center in the USAID building is as modern and efficient as any in Washington and in it you will see uniformed personnel sitting alongside USAID officers and representatives of other civilian agencies. Our military units and FEMA do a great job in the context of their own primary missions, and they are occasionally brought into a very serious disaster to augment OFDA. When FEMA handles a disaster, it is operating in an American state that can bring resources and institutions into play. National Guard units and police forces are mobilized to help in the effort. Leaving the Katrina hurricane failure aside, FEMA at its best can cope with the disasters it faces in the United States. However, I would not want to see FEMA operating in a developing country. It would not have a clue what to expect. Over at the U. S. Naval Institute (non-profit, professional military association of more than 50,000 members) Galrahn has blogged recently about how Obama’s Public Diplomacy From Haiti Wears Combat Boots. Countries like France are exactly right to call US actions in Haiti as “occupation” even if it is not true, because in case you haven’t noticed, every US spokesman on TV and covered in press conferences involved in public diplomacy from the ground in Haiti wears combat boots. There are serious coordination issues in Haiti, and it isn’t just the US with the UN or NGOs, because we would also not appear to be coordinating with other countries responding from sea, including NATO ships! The airport will not be able to meet the demand of inbound flights no matter how excellent a job the USAF 1st SOG does. Who is coordinating the effort at sea and in the port? How is it even possible that a Dutch naval ship is the first ship to unload materials in Port-au-Prince with all those US ships working on the port facilities, and at the exact same time the General is telling reporters something completely different? Did General Keen even know the Dutch ship was there when he was talking to reporters? Everyone should understand why the DoD is being asked to carry the load in Haiti, but it is critical you also understand why USAID or the State Department should be in charge in Haiti even though you can’t name who the top US civilian leader is in Haiti right now. The DoD budget is going to be somewhere around $700 billion with supplemental budgets in FY2011, and that gets compared to a USAID budget of $4 billion and the State Department budget of about $65 billion. Obviously the catastrophe in Haiti is beyond the means of either USAID and State to handle the problem, but does that also mean neither agency can’t afford to have a leader inside Haiti to lead the US effort? If the DoD is not the lead agency, and I do not under any circumstances believe they should be, why is the DoD being made the face of leadership in Haiti? Who and where is the Obama administration’s appointed representative? Rajiv Shah is in Washington DC, so who is running the show in Haiti? I do wonder if SOUTHCOM leaders are too buried in the internal politics of the UN and Haiti on the ground to support the relief efforts that involve the rest of the world, because General Keen seemed completely oblivious to what the Dutch were doing at the port – and activities at the port should be priority one. When you don’t know the name of the top US civilian leader in the Haitian relief effort, there is a serious political leadership problem. “People have been working flat out 24/7. Some folks have been up until 5 a.m.,” Susan Reichle, the USAID official who heads the coordination effort, told The Cable. Reichle is not in charge of the entire relief effort — her boss, USAID chief Rajiv Shah is — but her shop is the clearinghouse through which the information is channeled up and down the chain within the U.S. government. The interagency team is led by USAID’s Office for Disaster Assistance, but has representation from an alphabet soup of government entities, including DHS, FEMA, the Coast Guard, DOD, the Joints Chiefs, OSD, OCHA, HHS, the State Department, U.S. Southern Command, and U.S. Transportation Command. Shah isn’t in the room. He’s busy interfacing with top officials and lawmakers. Shah met with national security advisor Jim Jones yesterday, speaks with people like State Department counselor Cheryl Mills and Joint Chiefs Chairman Adm. Mike Mullen regularly, and went to Capitol Hill today to brief House appropriators. But Shah “is the decision maker,” Reichle emphasized. In the long term, it’s not clear that USAID will remain in charge. Although President Obama announced an initial $100 million for Haiti relief, a long-term budget is being put together at State’s Bureau of Foreign Assistance, the “F” Bureau, led by Rob Goldberg. In the past, USAID administrators have supervised the F Bureau, but under the current arrangement its money (as well as USAID’s) is controlled by Deputy Secretary of State Jack Lew, rather than Shah. Uh-oh! I have a funny feeling about all this. “Our foreign policy is premised on the idea that no country more than America stands to benefit when there is cooperation among peoples and states. And no country shoulders a heavier burden when conflict and misunderstanding drive nations apart. So we are well placed to seize the opportunities that come with interconnectivity. And as the birthplace for so many of these technologies, including the internet itself, we have a responsibility to see them used for good. To do that, we need to develop our capacity for what we call, at the State Department, 21st century statecraft. One big chunk of funding at issue is in foreign security assistance, known as the “1206” account, which could total about $500 million next year. This is money used to do things like military training and joint operations with countries outside of Iraq and Afghanistan, such as Indonesia and Somalia. Since the military doesn’t have the lead in those countries, the funding should flow through State, right? Well, not in 2011. The president’s budget will keep those funds in the Pentagon’s purse in its Feb. 1 budget release, following a pitched internal battle in which the State Department eventually conceded. “That literally is the result of vigorous arm wrestling within the administration,” one source familiar with the discussions said. The battle had been waged primarily between the shops of Under Secretary of Defense for Policy Michèle Flournoy and Assistant Secretary of State for Political-Military Affairs Andrew Shapiro, but finally Deputy Secretary of State Jack Lew got involved. Overall, State is expected to receive a hefty increase in its top-line budget request for fiscal 2011, but much of that money will be for Iraq and Afghanistan, allowing little growth in the rest of the State-USAID accounts. The slow pace of rebalancing national security spending and the lack of a comprehensive strategy for guiding that process is the subject of a new book by former OMB national security funding chief Gordon Adams, entitled Buying National Security: How America Plans and Pays for Its Global Role and Safety at Home.